"...and vowed, if he was successful, to make a thank-offering by building a temple to her in Rome as bringer of victory." The Temple of Venus Genetrix was dedicated by Caesar on September 26, 46 BC, the last day of his triumph (Dio, XLIII.22.1-3). 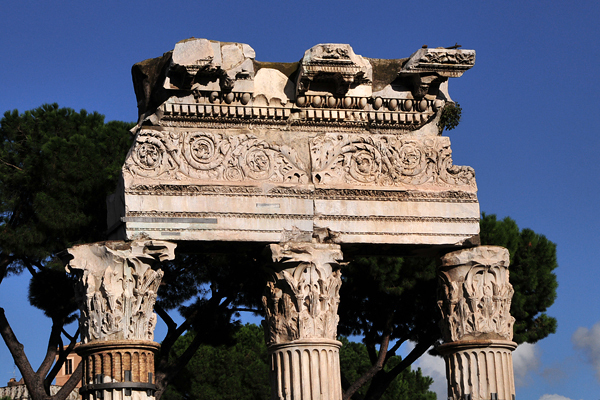 It was of marble (Ovid, Art of Love, I.81), almost square, Corinthian, with eight columns across the front (octastyle) set very close together (the diameter of one and one-half columns (pycnostyle); Vitruvius cites the temple as an example of the type, III.3.2) and eight down each side (peripteral). The high podium rose sheer in front and was ascended by two small lateral staircases. Inside the cella, there was a statue of Venus, as well as statues of Caesar and Cleopatra (Dio, LI.22.3; Appian, Civil Wars, II.102); numerous works of art, including Greek paintings; six collections of engraved gems (dactyliothecae); and a breastplate decorated with pearls from Britannia. The area was damaged by the fire of AD 80 and the temple rebuilt by Domitian (as can be seen in the Flavian style of the cornice). 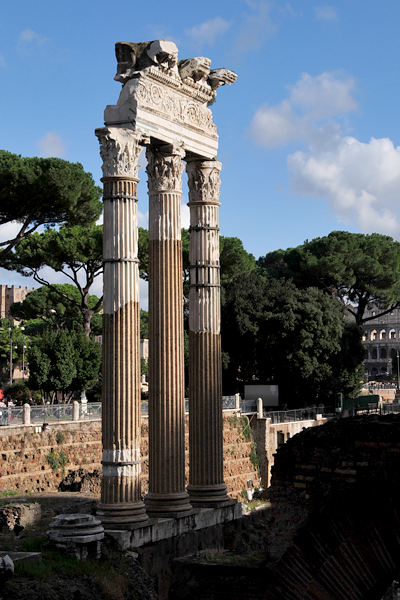 It was rededicated by Trajan in AD 113, the year his own forum was dedicated. The columns and entablature that were re-erected in the 1930s belong to that restoration. The rest of the forum lies in ruins. Reference: Appian: The Civil Wars (1996) translated by John Carter (Penguin Classics).